This describes the gigantic portrait, 14 feet high, honoring “Tata,” or father, the term of endearment many South Africans use for Nelson Mandela. Painted by South African artist Paul Blomkamp, this portrait deals with the anatomy of energy – a celebration of energized lines, shapes and spaces. 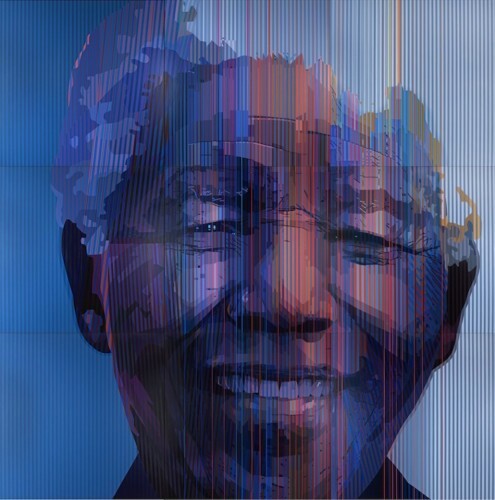 Thousands of vivid stripes suggest these shooting tracks of energy and the qualities the world celebrates in Nelson Mandela. Sixty-seven trillion is a very large number. To contemplate that the human body consists of 67 trillion UNIQUE atoms is nothing short of flabbergasting. Paul Blomkamp has “reduced” that staggering atomic number to 14’x14′– a remarkable feat. With his shimmering stripes he has captured the essence of a man who epitomized forgiveness. Perhaps that aptly summarizes Tata’s energetic dance: intelligence, compassion, love. Love what you and the artist have to say about creating fields of energy, however this portrait sure does not look like Mandela. Great observation, Roxene. But it could have been a portrait by Bacon. Imagine. Is it a painting? Or is it made with some sort of lighting? I’d love to see it in person. It’s very impressive. I think it looks like him. black & white reproduction of a photograph with Blomkamp’s acrylic stripes painted over it. But I cannot find a description of his process. Any one else have a suggestion? Hmmm. If you can’t find out, nobody can! The size of this portrait rightly speaks to the magnitude of mandela’s impact. Thanks for timely sharing Kirby! Interesting. The physics description of energy, the number of particles involved and its relationship to love, intelligence, and compassion sounds more like philosophy/romance than science. But, who knows? I certainly appreciate the dance metaphor and the wise and thoughtful comment above. I was growing up in New Zealand during the rugby controversy between the All Blacks and the Springboks. It was a turning point for the sport and for both countries. Mandela was undeniably a master catalyst for positive change.